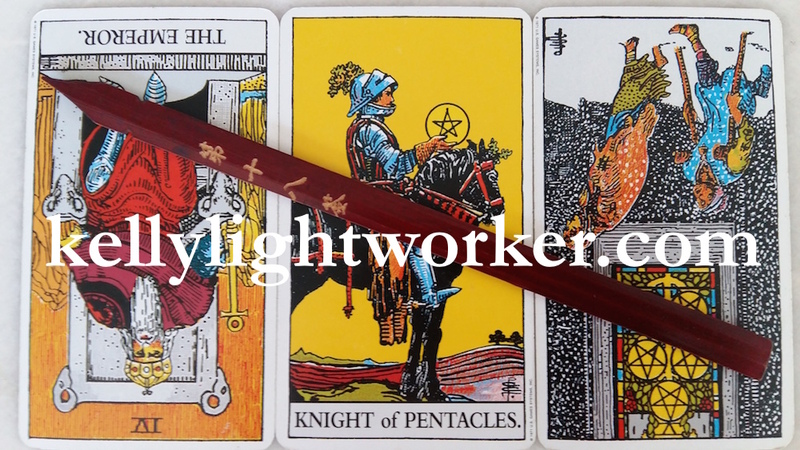 I’m so excited about this week’s divination post! Oh my Goddess, such blessing is coming for you all. Told you guys eclipse season can be a good thing, right? Let’s get to it! LEFT (RECENT PAST): THE EMPEROR REVERSED. Some of you have recently been let down. Someone or something that appeared powerful, responsible, trustworthy, the answer to your problems, failed to meet expectations. Disappointment is a bitter pill to swallow, but be of good cheer. To be honest, even if whatever you’d wanted was to work out, it wouldn’t have worked out well – the reversed Emperor has serious issues with commitment and responsibility. Either you’ll be left behind holding the baby, or you’ll be trapped under the thumb of a control freak. In other words, congrats – you dodged a bullet! MIDDLE (PRESENT): KNIGHT OF PENTACLES. So now you’re going to have to move forward. This card could represent yourself being strong and independent, and/or could also represent a reliable, diligent, trustworthy person coming your way to assist you. This person isn’t as flashy or impressive as an Emperor, but they’re solid, honest folk. Results won’t be immediate (out of all four Knights in the Tarot, the Knight of Pentacles is the slowest), but they will be secure. This Knight bides his time, but brings good news. Be patient. RIGHT (NEAR FUTURE): FIVE OF PENTACLES REVERSED. Whatever challenge you were facing will be resolved. The reversed Five Pentacles represents the end of poverty, deprivation, and scarcity. If you were looking for job opportunities, financial assistance, a helping hand, recovery from illness, beneficial relationships – they’re coming for you. The key is to reach out and ask for whatever you need. You are not alone; the Universe has your back and wants the best for you. Also, helping you out could be how other people earn good karma – don’t stop the flow of good karma! Reach out and help someone. help others by letting them help you! Interesting how this week’s Goddess divination lot mentions the solar and lunar cycles – the second total lunar eclipse of 2018 takes place this week on 28 July, starting from 1:14 am, reaching total eclipse at 4:21 am, and ending at 7:28 am (all dates/times given here are Singapore time, which is UTC+8). It’s a lunar eclipse in Aquarius; its energies are centred on clearing our collective karma and focusing on creating a better future for humanity. On a personal level, this lunar eclipse gives us the impetus to discover our highest life purpose, and the inner strength to accomplish it. Fixed signs will be the most affected – Taurus, Leo, Scorpio, and Aquarius, this is your time to shine!